Oftentimes, walking between Spitalfields and Covent Garden, I pass through Bunhill Fields where – in passing – I can pay my respects to William Blake, Daniel Defoe and John Bunyan who are buried there, and sometimes I also stop off at John Wesley’s Chapel’s in the City Rd to pay a visit to the underground shrine of Thomas Crapper – the champion of the flushing toilet and inventor of the ballcock. 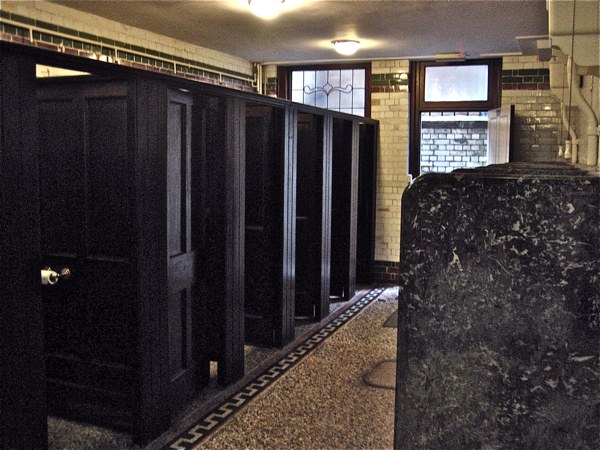 It seems wholly appropriate that here, at the mother church of the Methodist movement, is preserved one of London’s finest historic toilets, still in a perfect working order today. Although installed in 1899, over a century after John Wesley’s death, I like to think that if he returned today Wesley would be proud to see such immaculate facilities provided to worshippers at his chapel – thereby catering to their mortal as well as their spiritual needs. The irony is that even those, such as myself, who come here primarily to fulfil a physical function cannot fail to be touched by the stillness of this peaceful refuge from the clamour of the City Rd. There is a sepulchral light that glimmers as you descend beneath the chapel to enter the gleaming sanctum where, on the right hand side of the aisle, eight cedar cubicles present themselves, facing eight urinals to the left, with eight marble washbasins behind a screen at the far end. A harmonious arrangement that reminds us of the Christian symbolism of the number eight as the number of redemption – represented by baptism – which is why baptismal fonts are octagonal. Appropriately, eight was also the number of humans rescued from the deluge upon Noah’s Ark. 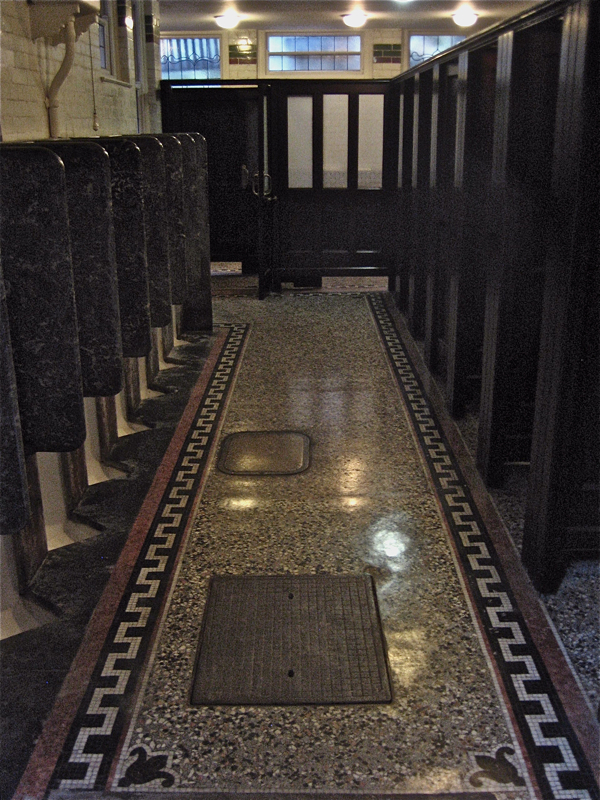 Never have I seen a more beautifully kept toilet than this, every wooden surface has been waxed, the marble and mosaics shine, and each cubicle has a generous supply of rolls of soft white paper. It is both a flawless illustration of the rigours of the Methodist temperament and an image of what a toilet might be like in heaven. 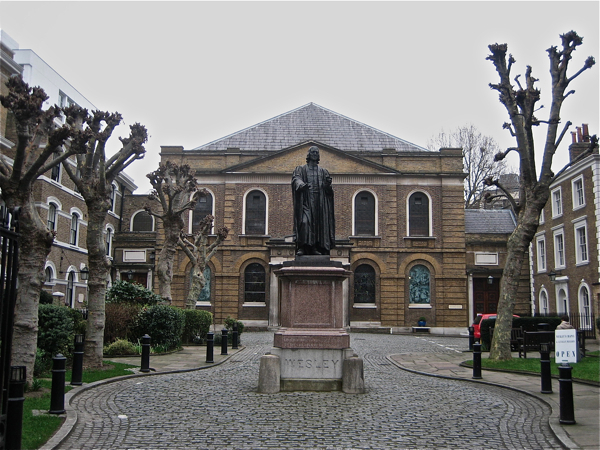 The devout atmosphere of George Dance’s chapel built for John Wesley in 1778, and improved in 1891 for the centenary of Wesley’s death – when the original pillars made of ships’ masts were replaced with marble from each country in the world where Methodists preached the gospel – pervades, encouraging solemn thoughts, even down here in the toilet. And the extravagant display of exotic marble, some of it bearing an uncanny resemblance to dog meat, complements the marble pillars in the chapel above. Sitting in a cubicle, you may contemplate your mortality and, when the moment comes, a text on the ceramic pull invites you to “Pull & Let Go.” It is a parable in itself – you put your trust in the Lord and your sins are flushed away in a tumultuous rush of water that recalls Moses parting the Red Sea. 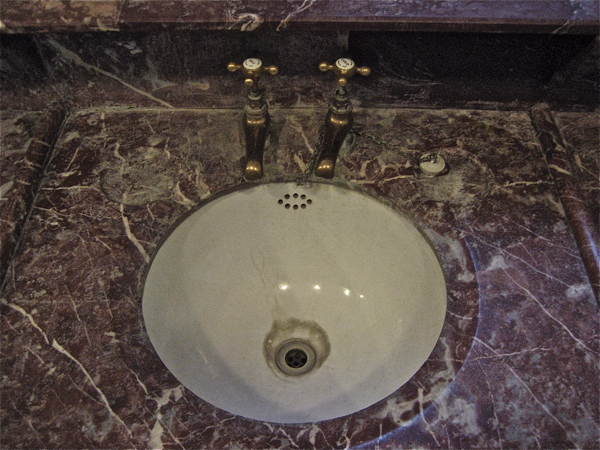 Then you may wash your hands in the marble basin and ascend to the chapel to join the congregation of the worthy. Yet before you leave and enter Methodist paradise, a moment of silent remembrance for the genius of Thomas Crapper is appropriate. Contrary to schoolboy myth, he did not give his name to the colloquial term for bowel movements, which, as any etymologist will tell you, is at least of Anglo-Saxon origin. 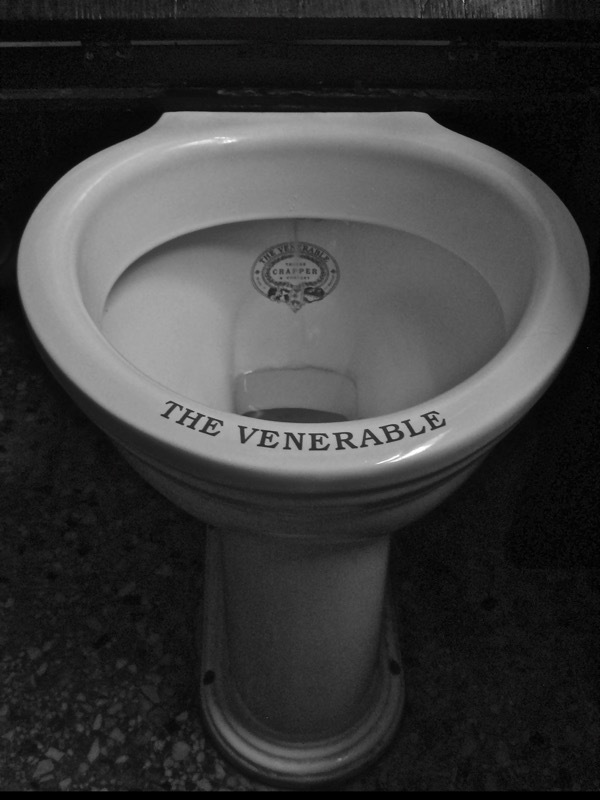 Should you lift the toilet seat, you will discover ”The Venerable” is revealed upon the rim, as the particular model of the chinaware, and it is an epithet that we may also apply to Thomas Crapper. Although born to humble origins in 1836 as the son of a sailor, Crapper rose to greatness as the evangelist of the flushing toilet, earning the first royal warrant for sanitary-ware from Prince Edward in the eighteen eighties and creating a business empire that lasted until 1963. 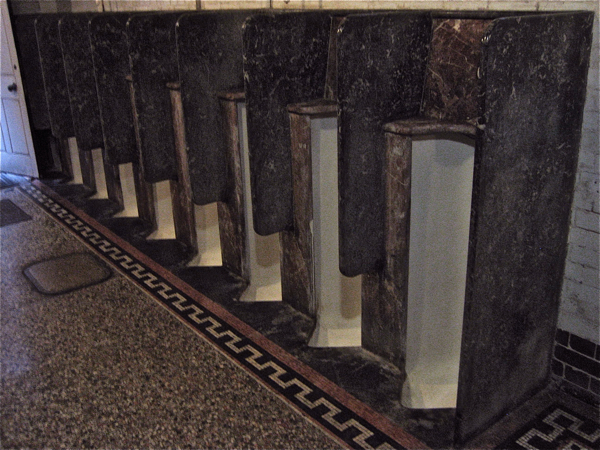 Should your attention be entirely absorbed by this matchless parade of eight Crapper’s Valveless Waste Preventers, do not neglect to admire the sparkling procession of urinals opposite by George Jennings (1810-1882) – celebrated as the inventor of the public toilet. 827,280 visitors paid a penny for the novelty of using his Monkey Closets in the retiring rooms at the Great Exhibition of 1851, giving rise to the popular euphemism, “spend a penny,” still in use today in overly polite circles. 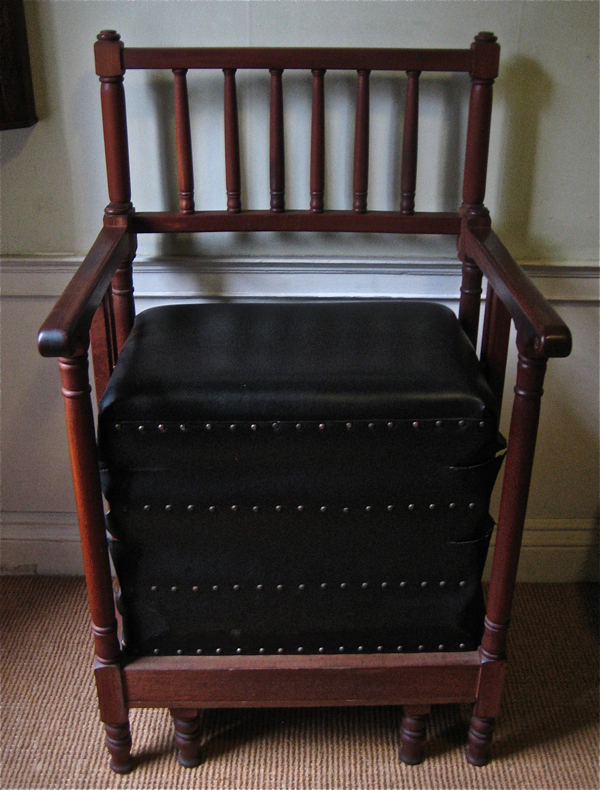 Once composure and physical comfort are restored, you may wish to visit the chapel to say a prayer of thanks or, as I like to do, visit John Wesley’s house seeking inspiration in the life of the great preacher. Wesley preached a doctrine of love to those who might not enter a church, and campaigned for prison reform and the abolition of slavery, giving more than forty thousand sermons in his lifetime, often several a day and many in the open air – travelling between them on horseback. 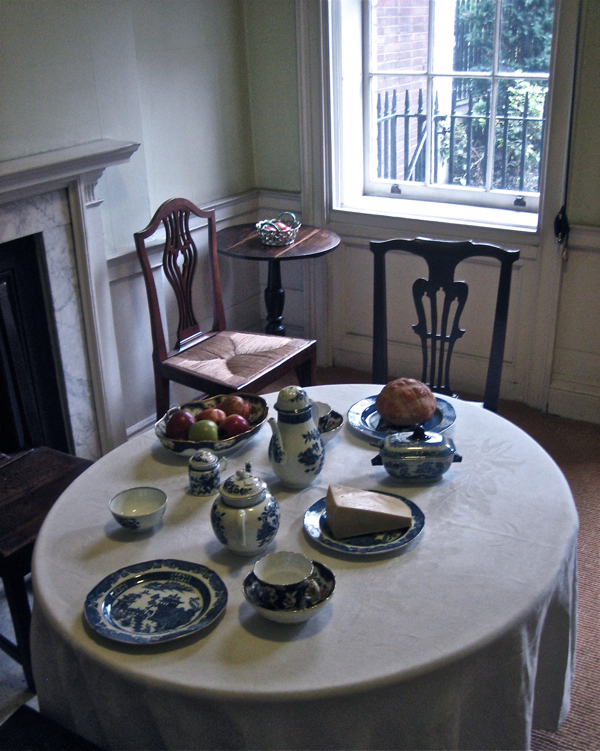 In his modest house, where he once ate at the same table as his servants, you can see the tiny travelling lamp that he carried with him to avoid falling off his horse (as he did frequently), his nightcap, his shoes, his spectacles, his robe believed to have been made out of a pair of old curtains, the teapot that Josiah Wedgwood designed for him, and the exercising chair that replicated the motion of horse-riding, enabling Wesley to keep his thigh muscles taut when not on the road. 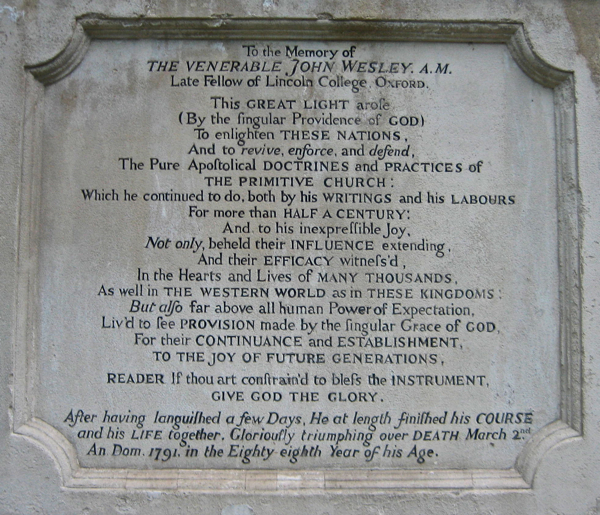 A visit to the memorial garden at the rear of the chapel to examine Wesley’s tomb will reveal that familiar term from the toilet bowl “The Venerable” graven in stone in 1791 to describe John Wesley himself, which prompts the question whether this was where Thomas Crapper got the idea for the name of his contraption, honouring John Wesley in sanitary-ware. 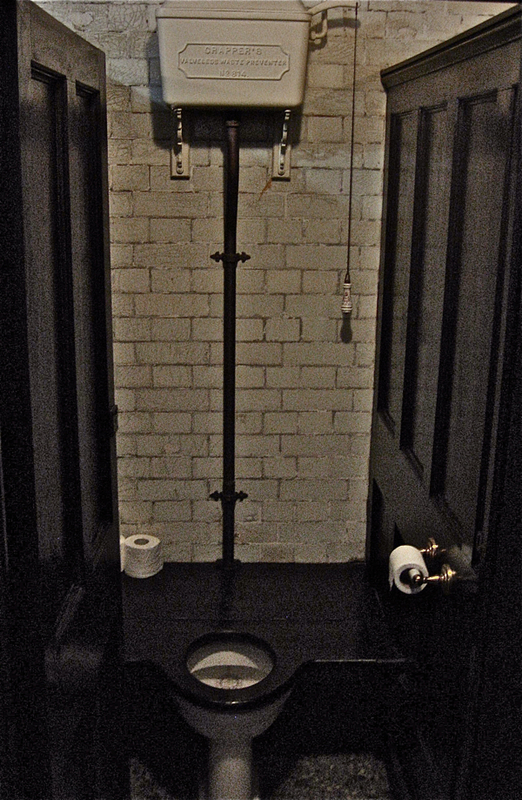 Let us thank the Lord if we are ever caught short on the City Rd because, due to the good works of the venerable Thomas Crapper and the venerable John Wesley, relief and consolation for both body and soul are readily to hand at God’s convenience. 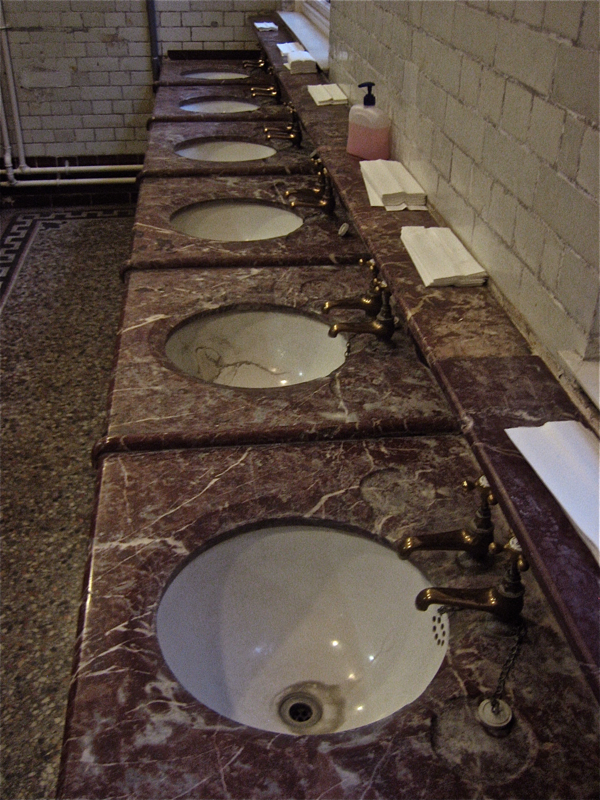 Nineteenth century fixtures by Thomas Crapper, still in perfect working order. 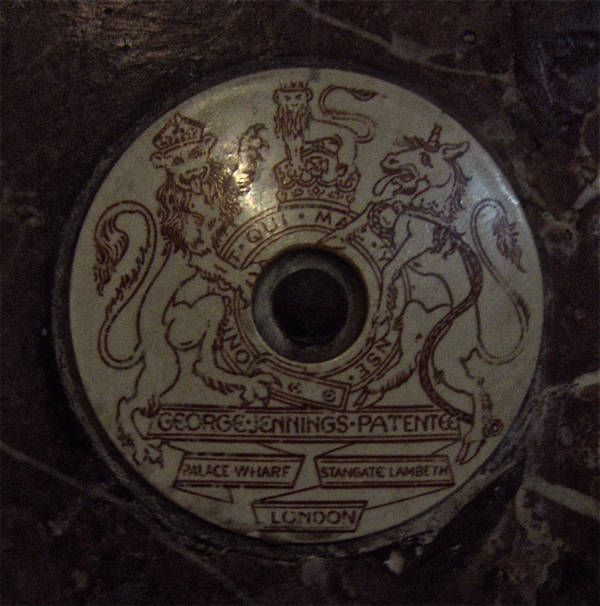 In memoriam, George Jennings, inventor of the public toilet. 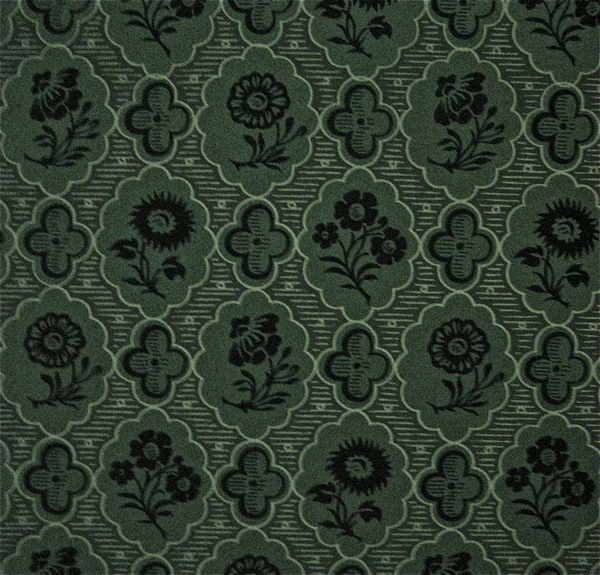 New wallpaper in John Wesley’s parlour from an eighteenth century design at Kew Palace. 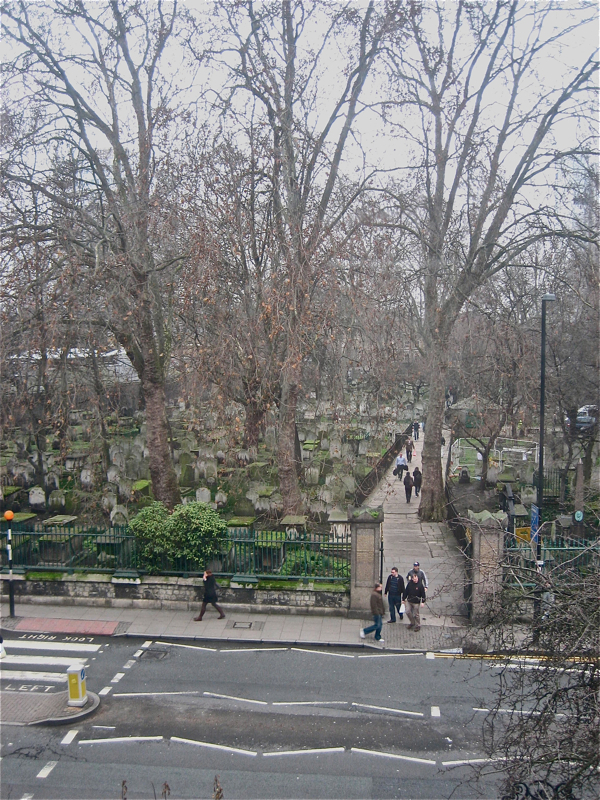 The view from John Wesley’s window across to Bunhill Fields where, when there were no leaves upon the trees, he could see the white tombstone marking his mother’s grave. This is a really nice piece by GA today packed with info. Thomas Crapper, John Wesley & and Kew Palace a 18thc design wallpaper !now that was a surprise. Poet John – Poetry Soc. But you didn’t mention a crucial point – is there a Ladies on site as well?? Very interesting piece, as per uusual. Didn’t know this loo had survived the closures which started during the reign of Thatcher. There is another still open and functioning (sometimes) at South End Green in Hampstead. Same use of marbles, same solid wooden cubicles. In need of a bit of a spit and polish, but another happy (and useful!) survivor. Wonderful: a splendidly tongue-in-cheek (if that’s the appropriate phrase) piece! I shall keep all this in mind for the next occasion when I go for a stroll across Bunhill Fields. I’ve had the pleasure of visiting these gents. When I first walked down to them. I wasn’t expecting much but I was stunned by it’s original character. It’s worth visiting for that alone. Did you notice the silver buckles with the shoes? They were presented to my 5x-great-grandparents when they sheltered John Wesley when he was preaching at Mevagissey in 1753, kept in the family and eventually presented to the museum. By the way, for those asking, there is a Ladies, but it’s not as ornate as the Gents. Oh, so very British. Delightful. You’ve made my day. Marvellous. 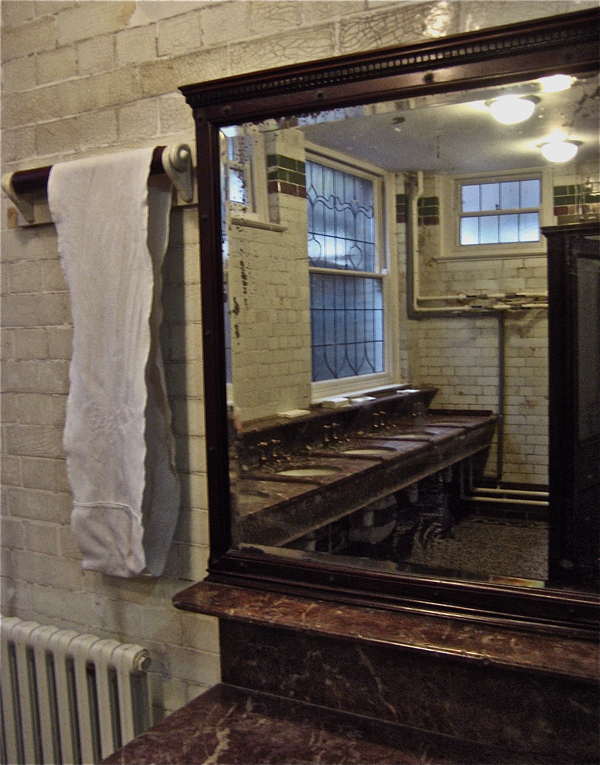 It reminds me of the gents lavatory in the Philharmonic pub in Liverpool which has survived because the pub is listed. Very funny and instructive piece, thank you! I think I will stop to the Chapel next time I am around Bunhill Field to say Helloo! I thoroughly enjoyed reading about John Wesley. I’m curious about the photo captioned “In memoriam, George Jennings, inventor of the public toilet.” – where is the medallion located and is there a hole in the center for some sort of drainage? A perfect example of the writing and humour that we come to this website to enjoy. (Though I think I’d have written “Contrary to schoolboy myth” as ‘schoolboy mirth’!). Thanks for this piece. I have a yen to Visit London,mostly to visit the various places around the east end my Forebears lived at prior to 1900. 1st place on my list is the Wesley Chapel as my GGG grandfather,the Rev Jabez Bunting is also buried in there .After seeing the gents,I feel the advancing years will not be problem for me. 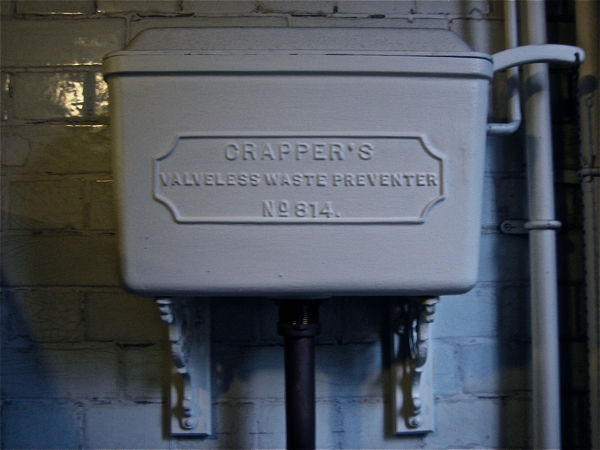 I often feel sorry for Thomas Crapper, he gave us his invention to flush our toilets but his name has gone down in history by being used as a verb that is famous throughout the world. Great photos! and so well put. I have allways been a big fan of simple things. The self flushing tiolet is just one of them along with the old mouse trap! Hats off to Mr Crapper and all who enjoy the simple things in life! Ps,,, I think his is grave is in Beckenham/ Anerly hill cemetery? 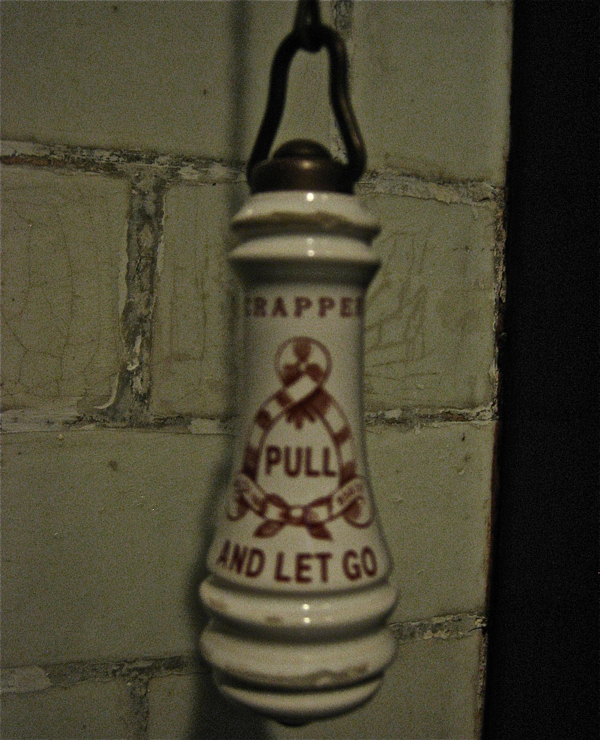 I had an old freind who was a member of The Thomas Crapper Society. Delightful!!! I will be chuckling for days. I also gained a hint about the identity of our dear friend the GA, at least your gender, as you did not mention being at all leary of entering the men’s side, and had nothing to note of the ladies decor. Tho, is it possible Methodists have genderness convieniences? I also gained a hint about the identity of our dear friend the GA, at least your gender, as you did not mention being at all leary of entering the men’s side, and had nothing to note of the ladies decor. Tho, is it possible Methodists have genderless convieniences? Very funny. Must ‘pay a visit’. There are two Ladies toilets on-site, close at hand.